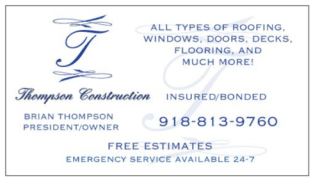 For all of your construction needs in the Grand Lake area, Thompson Construction is the one phone call you need to make. Brian Thompson has a lifetime of experience in the construction trades around Grand Lake, from extensive remodels to new decks and everything in between. That even includes your excavation needs! We always hear the stories about how hard it is to find a reliable Grand Lake based contractor that will show up. Well, when Brian hears those stories, he knows that those people never called him! With a local reputation to uphold and a skilled crew available, Thompson Construction can handle all of your construction needs on your Grand Lake project. Call Brian today at 918-813-9760 to reach a reliable Grand Lake contractor.